A day after the death of a police officer in Maryland who was hit by a suspected drunk driver, calls are increasing for harsher driving-under-the-influence punishments in the state. Speaking after the death of Officer Noah Leotta, 24, Montgomery County Police Chief J. Thomas Manger spoke furiously. “The state of Maryland has some of the weakest penalties for drunk drivers, and in fact, as we look ahead to the prosecution of this case, I can tell you that whenever it’s done, there’s little chance of real justice being done,” he said. Leotta was critically injured the evening of Dec. 3 when a driver suspected of being drunk slammed an SUV into Leotta’s cruiser and then into the officer as he pulled over another driver suspected of being drunk. The driver, Luis Gustavo Reluzco, 47, has not been charged. Results of a blood test to detect substances in his system are pending. The maximum penalty in Maryland for killing someone while driving drunk is 10 years, but few defendants ever get that sentence, advocates say. “Generally, when someone [driving drunk] kills someone in Maryland, they’re looking at about 18 months,” said Lisa Spicknall, state director of Mothers Against Drunk Driving. She has helped hundreds of families cope with the loss of a loved one to a drunk driver. “We all would think that such a person would go to jail for a long time, but number one, the judges are inconsistent. Number two, the prosecutors are inconsistent in terms of seeking serious penalties. And number three, the laws just don’t provide for a long jail sentence,” Spicknall said. “It’s a traffic offense, it’s not a criminal offense,” Rene Sandler said. She’s a criminal defense attorney and former prosecutor who also was the victim of a drunk driver. In Virginia and D.C., penalties for fatal drunk driving carry 20 to 30 years in prison. 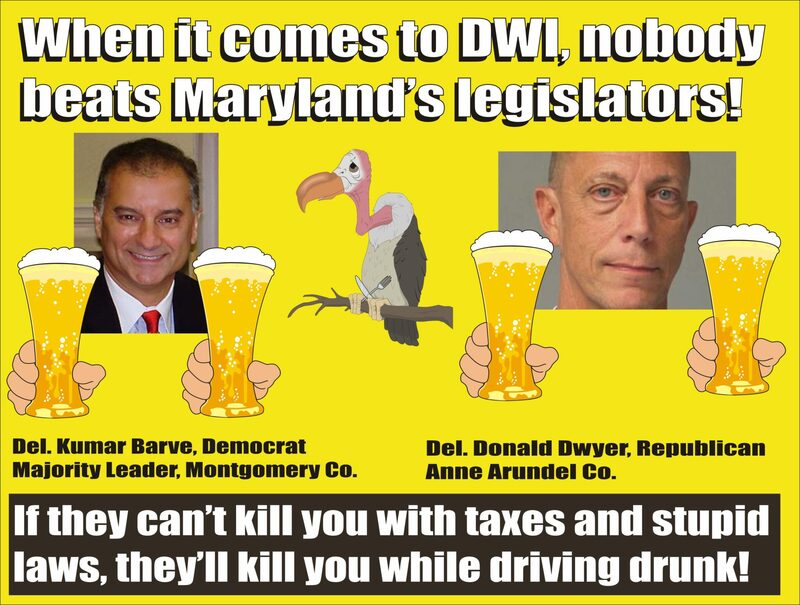 Also, unlike in other states, Maryland does not allow victims or their families to sue a person or establishment that served a drunk driver too much alcohol. Last year, 121 people were killed in Maryland by drunk drivers. Short prison sentences for drunk drivers re-traumatize their families, Spicknall said. “It sets them back to day one, to that day when they were first informed that their loved one was killed,” she said. The MADD leader said she hopes the tragedy of Leotta’s death can spark change among lawmakers. “Maybe this is the case that makes the senators and delegates step up and say, ‘We’re done with this and we’re tired of it and we want to see these laws,'” Spicknall said. Advocates will return to Annapolis next year to urge lawmakers for harsher penalties. This entry was posted in Boating while impaired, Celebrities and other idiots, Crooked judges and lawyers on DWI cases, DUI convictions, DWI Arrests by State, DWI crash photos, DWI news articles, injury or death, Judges and Lawyers charged DWI / DUI, Politicians charged with DWI/DUI and tagged boating crash of boozing GOP delegate, boating while impaired Del Donald Dwyer, Del Kumar Barve, Lisa Spicknall, lobbyist cocktail parties, Luis Gustavo Reluzco, MADD, majority leader DUI arrest, many Maryland lawmakers are lushes or lawyers or both, Maryland legislators DUI arrests, Montgomery County Police Chief J. Thomas Manger, Officer Noah Leotta, Rene Sandler, state director of Mothers Against Drunk Driving.. Bookmark the permalink.